Pimarc's software was created by Holstead & Redmond Limited, a land survey company in London, Ontario who has been in the business for over five decades. The company works daily with engineers, architects and construction companies and they needed a better way to manage their projects, records and files. This is when Holstead & Redmond created their survey records index (SRI), they were able to better manage their files according to how these businesses in each specific industry operates. The software went through a lot of detailed expansion and refinement before it was commercially releases in 2004. The software was well-received by other land surveying companies who were experiencing similar challenges in their daily operations and was expanded to target the needs of architects and engineers. Pimarc is currently used by land surveyors, architects and engineers across the United States and in Canada. Holstead & Redmond still serves as the "live laboratory" and testing ground for any new features that are rolled out to the software users. Pimarc's main goal is continue to meet the evolving needs of engineers, architects and land surveyors in the real world. Pimarc software will help your engineering company streamline its workflow and reduce duplication, saving you time, energy and money. Employee productivity will be increased and so will your bottom line. 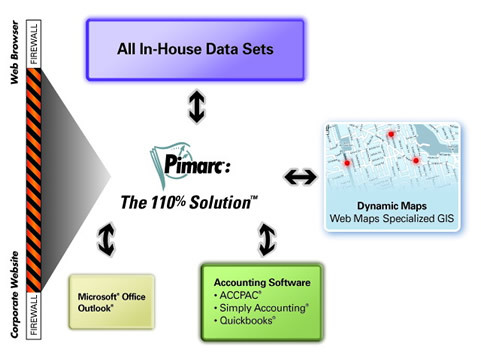 Pimarc is a secure web-based application that seamlessly integrates with numerous other software applications and data sets. In addition to Pimarc project management software for engineers, PRL Info Systems also offers a full range of project management services that will improve your engineering business. These include workflow analysis, expert consulting, data transfer and document scanning, outsourced project management services and more. Contact us today to learn more about Pimarc for engineers and to try it for free!